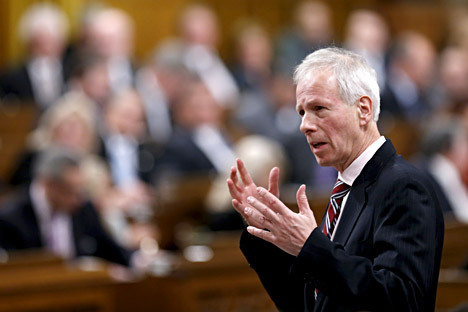 Canada's Foreign Minister Stephane Dion speaks during Question Period in the House of Commons on Parliament Hill in Ottawa, Canada, January 25, 2016. Canada’s Foreign Affairs Minister Stéphane Dion said on January 26 that he sees a need to resume dialogue with Russia, in particular, over matters related to Ukraine. This conciliatory message from Ottawa came in response to statements by Russian foreign Minister Sergei Lavrov, who said that the last two years were a "lost opportunity" in terms of bilateral relations between the two countries. While commenting on the current condition of relations between Ottawa and Moscow, Canada’s Minister of Foreign Affairs Stéphane Dion has declared it necessary to resume dialogue with Russia, which were practically broken off due to the crisis in Ukraine and the sanctions imposed against Russia. "Canada was speaking to the Russians even during the tough times of the Cold War. And now we are not speaking ... because of the former policy, of the former government," Dion said on Parliament Hill according to the Canadian Broadcasting Corporation (CBC). "In which way is this helping Ukraine? In which way is this helping our interests in the Arctic?" "We have a lot of disagreements with the government of Russia but it's certainly not the way to stop speaking with them when the Americans speak with them and all the Europeans, the Japanese, everybody except Canada," Dion added. Russian Foreign Minister Sergei Lavrov recently told reporters in Moscow that the last two years were a "lost opportunity" in terms of bilateral relations between Canada and his country. Russia's Ambassador to Canada, Alexander Darchiev, agreed with Lavrov in a comment to CBC News Network's Power & Politics on January 26 stating that from the previous Canadian government he had occasionally seen "ideology put before pragmatism, and this was counter-productive in terms of Canada's own interests." According to Lavrov the ascension to power of a new Canadian government headed by Prime Minister Justin Trudeau increases the chances for a thaw in Moscow-Ottawa relations.